Once again, the CDA participated in #ArtsDay on the Hill in Ottawa, on October 2, 2018. This year Kate Cornell was joined by dance advocates Mimi Beck (CanDance Network), Cynthia Lickers-Sage (IPAA), Cathryn Gregor, John Dalrymple and Jenna Rose (NBS), Parise Mongrain (DTRC), Fannie Bellefeuille (RUBBERBANDance), Alix Laurent (ESBQ), Lesley Bramhill (CDA), Barry Hughson (National Ballet) and Kate Fennell (RWB). In addition, 25 letters were sent to Federal MPs across the country by CDA members. Thank you! 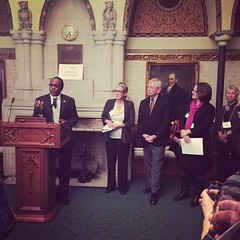 At Arts Day, over 100 arts advocates from across Canada traveled to Parliament Hill to deliver the messages of the Canadian Arts Coalition and to encourage continued investment to our vibrant and creative sector. The Coalition’s messaging this year was focussed on addressing weak links in the creative value chain. In order to create synergies with previous federal investments, Arts Day delegates sought support in three areas: 1) Arts presentation in Canadian communities; 2) Training and internships; and, 3) Charitable donation incentives. In total, there were 94 meetings with 104 delegates representing 77 arts organizations. These messages were well received by 75 MPs of the Liberal, Conservative, NDP, Bloc, Green parties as well as 2 independent MPs and 17 Senators. Click here to read the full recap by the Canadian Arts Coalition. Arts Advocates work on taxation issues in Canada. In June 2018, the Canadian Arts Coalition created a Committee on Taxation and the Artist (for artists facing challenges with audits and reassessments at the CRA) and the Performing Arts Tax Group had success in implementing a simplified income tax process for non-resident artists in Canada. Read more from CAPACOA on the latest in streamlining international taxation. In May 2018, Kate Cornell appeared in front of the Standing Committee on Canadian Heritage to discuss leadership in the arts. "There are lots of women working in the arts, but the jobs for women are precarious and are rarely stable leadership positions." She presented four recommendations on research and regulatory action. Read the full brief submitted to CHPC here. Kate Cornell gives inside scoop on the advocacy behind the Respectful Workplaces Announcement by Canadian Heritage and the Canada Council for the Arts. "The Canadian Arts Coalition was proud to play its role in this monumental funding decision. This success story is a testament to the vital importance of arts advocacy." -Kate Cornell, Co-Chair of the Canadian Arts Coalition. Read the full article here. On March 29, 2018 the Canadian Arts Coalition appeared before the Standing Committee on Canadian Heritage as the part of the Study on Cultural Hubs and Cultural Districts in Canada. The Co-Chairs of the Coalition, Kate Cornell and Frédéric Julien, presented a testimony inspired by the 2016 infrastructure brief. The testimony highlighted the need for affordable housing for artists in cultural districts, the need for greater coordination between the federal government and the provinces on cultural infrastructure, and the need for specific funding for the maintenance of cultural spaces, both old and new. Read the testimony here. Budget 2018 - What about artists? The Canadian Arts Coalition (CAC) is surprised by Budget 2018’s oversight of artists. This budget focuses on women, Indigenous, and marginalized members of the Canadian society, which is commendable. Yet, if the goal was to highlight precarious workers, the federal government missed the opportunity to recognize the role that 650,000 cultural workers play in the Canadian economy. “Although Budget 2018 is marked by the absence of the Canadian Arts Coalition’s recommendations,” says Kate Cornell, Co-Chair of the Canadian Arts Coalition and Executive Director of the Canadian Dance Assembly. “We will continue to work with the federal government on issues such as anti-harassment, international market access, and access to the performing arts in Canadian communities.” Read the full release here. Kate Cornell was also interviewed about how artists are impacted by Budget 2018 by Canadian Art. The Canadian Arts Coalition organized Arts Day on the Hill 2017 on November 2nd this year. Dance was well represented with Joel Klein, Shannon Litzenberger, John Dalrymple, Christine Friday, and Kate Cornell boldly advocating for the training institutes, festivals, and presenters.This Arts Day was all about building relationships with MPs from all parties, Senators, and bureaucrats. That afternoon Minister Mélanie Joly answered questions from the Standing Committee on Canadian Heritage regarding the Creative Canada cultural policies. The day ending with a lovely reception in Centre Block hosted by Toronto Danforth MP Julie Dabrusin. Choreographer and dance artist Christine Friday spoke eloquently about reconciliation and the power of dance in Canadian society. For more on Arts Day 2017, click HERE. October 2017 - Arts Day is on November 2. Meet with your MP! This year, the Canadian Arts Coalition is organizing a smaller scale Arts Day. The Coalition will seek meetings with 15-20 key individuals to address specific messages. The Coalition will not be coordinating meetings other than the 15-20 targets, but they are heartily encouraging member organizations and individuals to seek meetings with their own MPs on Arts Day. In this way, you can lead with your own concerns (ideally centred on a specific Coalition recommendation) and leave behind a CAC messaging piece. As requested, the CAC will connect independent delegates with others hoping to meet with the same MP. More from the Coalition below. Read more here. April 25, 2017 - Tell your MP that dance matters to you! This International Dance Day, remind your MP that you care about the arts. If your MP is a member of the government, please say thank you for the increases in arts funding in Budget 2016 and 2017. If your MP is in opposition, please encourage them to support the arts in their riding. Want to do more? Share this letter with friends and family. Arts Day 2016 - The Largest in History! Ensure that Canadian artists are consulted during the current Digital Culture consultations. These messages were well received by MPs of all parties. In total, we had 112 meetings, including 6 meetings with Ministers and 9 meetings with ministerial staff. A sincere thank you to all those who joined the Canadian Arts Coalition in Ottawa, representing artists and arts organizations from across the country! The strength and diversity of our voices was affirmed as we thanked and celebrated Parliamentarians for their support of the arts and cultural sector, and challenged them to join us in shaping an even brighter future ahead. Read the full Arts Day recap at the Canadian Art Coalition. The 2016 Arts Day on the Hill could not have been possible without the tireless work of our partners and sponsors. The Canadian Arts Coalition would like to recognize: Kate Cornell, Aviva Fleising and the Canadian Dance Assembly, Frédéric Julien and CAPACOA, the Canadian Arts Summit, the Professional Association of Canadian Theatres (PACT), CARFAC National, the National Arts Centre, Global Public Affairs, iPolitics, Via Rail, WestJet and Beau’s Brewery. On March 14th, Minister of Canadian Heritage Mélanie Joly, along with the Parliamentary Secretary for Heritage Randy Boissonnault, attended a roundtable with Toronto arts organizations and leaders hosted by MP Adam Vaughan. Minister Joly is an arts supporter with a detailed knowledge of the sector. Her priorities include a digital cultural strategy and international touring and promotion. Joly and Boissonnault listened attentively to all the stakeholders in the room, including Barry Hughson from the National Ballet of Canada and Kate Cornell from the Canadian Dance Assembly. Recently, Joly attended roundtables in Vancouver, Montreal, and Halifax with several members of CDA’s National Council. Ontario’s culture strategy Your ideas will help us design Ontario’s Culture Strategy, which will set a vision for arts and culture, define priorities and guide support for the sector in the years to come. This is part of our Open Government commitment to engage citizens and gather public input before policies are made. In winter 2016, we will report back about what we heard, before posting a draft strategy for public input. To learn more or see how you can be involved click HERE. Are you ready for the election? The Coalition has got you covered! Voting is the first step and there’s much more that we can do together. The Coalition is lucky to have a broad network of artists, organizations, and supporters that continue to advocate for a resilient arts and culture sector in Canada. Your voice is vital during the 2015 election and that’s why they have put together a handy toolkit to assist you from now until October, and beyond! Ready to vote on October 19? Check out Elections Canada for voter registration and ‘how-to’ information.You can use the following documents to help spread the word via social media, to your networks, and to political candidates. Not since the Massey Commission, has the dance sector had the opportunity to talk directly to the Government of Canada about its policies. On May 4th, 13th, and 25th, 2015, twenty-five representatives of the dance sector offered the Standing Committee on Canadian Heritage briefs and presentations about the state of Canadian dance. The ten MPs that make up this Committee asked lots of questions about what it means to be a dance artist or organization in this country. This historic study has resulted in a Review of Dance in Canada with seven recommendations for the Government of Canada. These seven recommendations represent the advocacy priorities for the CDA for the next decade. The CDA’s Advocacy Committee is already hard at work on making sure these recommendations result in governmental policy. A special thank you to the Dancer Transition Resource Centre and Regroupement québécois de la danse for their support and partnership in this advocacy endeavour. A last thank you to National Council President, Jason Dubois, the CDA’s eyes and ears at the presentations. March 16, 2015 - On behalf of a collective of 17 performing arts organizations representing more than 1,000 stakeholders, CAPACOA sent a letter outlining a series of recommendations for improving the administration of Regulation 105, a required withholding tax on fees paid to foreign artists. The letter, addressed to the Honourable Kerry-Lynne D. Findlay, Minister of National Revenue, and the Honourable Joe Oliver, Minister of Finance, explains the practices of performing arts organizations with regard to foreign artists. It affirms: "Contracting non-resident artists is a lever that allows the performing arts industry to create more employment and growth opportunities, both on Canadian and international stages." Executive Director, Kate Cornell participated in Arts Day at City Hall in Toronto, on February 12th. This important day of municipal advocacy included an impromptu conversation with new Mayor John Tory. Tory took the time to talk with arts advocates, including Roshanak Jaberi of Expect Theatre, and exhibitors like Ka:hawi Dance Theatre. The Arts Day message of exceeding the $25 per capita funding post-2017 was presented to more than 30 Councillors. Check out #ArtsDayTO on Twitter for more photos. CDA has had a very busy fall in its advocacy work for the dance sector. Working on our own, and with colleagues in other disciplines, we have been involved in activities affecting artists' health and well-being as well as issues affecting how artists work in the field. Click to read the advocacy update relating to Arts Day on the Hill, the Healthy Artist Trustand the Temporary Foreign Worker’s Program. View additional advocacy issues CDA is actively engaged in here. On November 27, Coalition Co-Chair Kate Cornell was among a select group of 17 business people, academics and innovators invited to participate in a pre-budget consultation with Finance Minister Joe Oliver in Toronto. This meeting was the latest in a series of pre-budget activities which also involved a brief, a hearing with the Standing Committee on Finance and, of course, Arts Day on the Hill. If you have an opportunity to talk to your own MP about the value of the arts between now and the release of the federal budget, please contact the Canadian Arts Coalition for messaging, tips and tools. On October 21st, 102 arts advocates from across the country converged in Ottawa to meet with 97 MPs, Senators and senior staffers about arts funding. Dance was well represented including CDA National Council President Jason Dubois, Executive Director Kate Cornell, and General Manager Aviva Fleising. We each had meetings with MPs from all four political parties. Even though I am on maternity leave, I could not miss the opportunity to meet with these important representatives; for example, I had the pleasure of meeting with Elizabeth May, leader of the Green Party. 1. Increase the Canada Council for the Arts’ Parliamentary appropriation by $35 million in 2015 with a long-term goal of reaching $300 million. 2. Increase Canada’s presence on the world stage for 2017 by establishing a $25 million pilot program over three years at the Department of Foreign Affairs, Trade and Development for Canada’s 150th birthday. 3. Investigate new revenue models to support a comprehensive Canadian Cultural Digital Strategy that would enable the creation, dissemination and engagement of Canadian cultural content online. Artists and other cultural professionals are generally self-employed, their earnings are low compared to other Canadians, and it often fluctuates from year to year. Most artists and independent cultural professionals do not have access to benefits generally enjoyed by other Canadians. Medical, dental and life insurance for Arts Professionals: A Proposal for a Public Private Partnership Brief to the Standing Committee on Finance, Healthy Artists Trust.